A small room – boudoir that easily re-reads the quirk and sensuality of every woman so as to be inspired by the icon of elegance par excellence Audrey Hepburn portrayed in her most famous cinematic masterpiece, “Breakfast at Tiffany”, based on the book by Truman Capote that you can enjoy reading right in this corner of Antichemura. Delicate pastel colors and exposed beams make Artemisia our most romantic and evocative room. 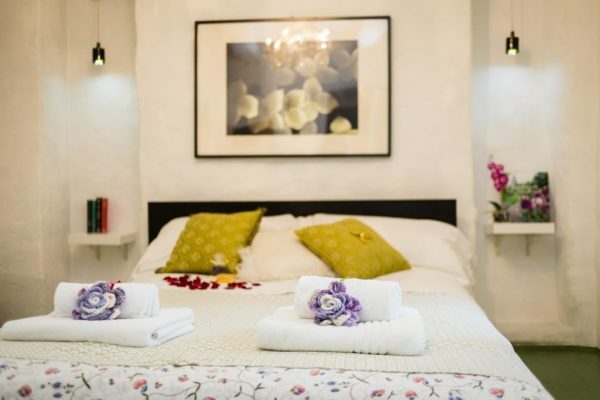 Spacious and bright, it will make your stay comfortable with its typical Tuscan style finishes, some touches of Provençal notes to give it lightness, lace and small decorations with a nostalgic soul. The inspiring muse is the Italian painter Artemisia Gentileschi, who lived in the 17th century and is beautifully portrayed in a plot of courage and passion by the writer Susan Vreeland whose pages, if you want, can keep you company. Our “petite” has the colors of the sky and the scent of lavender. Cozy and refined, it owes its name to one of the most fascinating and complicated protagonists of the feminine universe of French literature. The pen of Gustave Flaubert has made the most enigmatic aspect of every woman immortal, and we have chosen it for this. 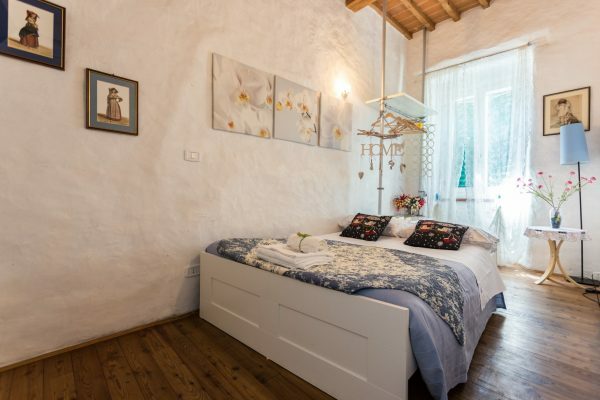 The Clarissa room, in soft and luminous tones, is a small jewel of Antiche Mura that combines the full-bodied white of the walls with the relaxing green of the furnishings and decorations, so as to create a pleasant, bright and welcoming environment. Homage to the famous character of the extraordinary writer Virginia Woolf, unforgettable synthesis of elegance and sensitive feminine fragility, born, not by chance, where once there was a gracious kitchen in which affects and flavors were mixed every day, just as happens in the pages of this literary masterpiece. 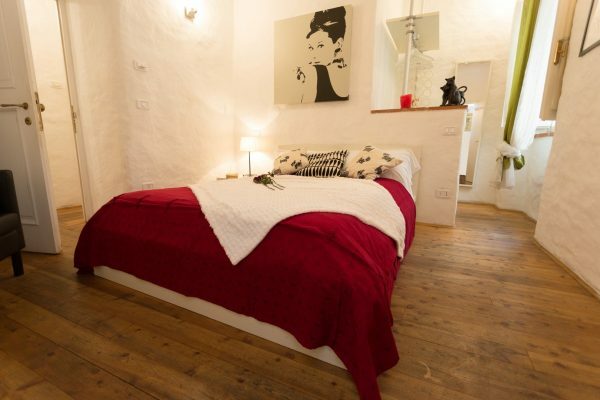 The Matilde room is comfortable and particularly intimate. Rich in delicate details, it offers comfortable and relaxing spaces in a cozy environment. Inspired by the wise duchess Toscana Matilde di Canossa 1000 years ago, the times even in terms of hospitality welcomed the pilgrims and was first herself a great traveler. The absolute myth. Marilyn, the goddess, could not miss in a b & b that paid tribute to some unforgettable women protagonists of stories, books, life.